Sunward Games proudly presents the latest chilling chapter in the Endless Fables series! 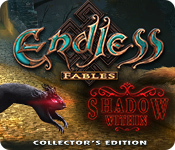 Endless Fables: Shadow Within Collector's Edition is rated 3.7 out of 5 by 18. Rated 5 out of 5 by msminton from Endless Fables: Shadow Within. I seldom review a game, but I have to say that the music and the sounds in this game are amazing! Rated 5 out of 5 by radrocker from Another Endless Fables Classic I love everything about this game and the series. Beautiful art and a fun story will really pull you in! Rated 5 out of 5 by Marusya55 from Great Game I love everything about this game! Visuals are stunning. Love voice over, very artistic. Also storyline, not usual . Thank you for the game! Rated 5 out of 5 by alwaysplay from Nightmares This is one of the best games I have played in along time,I loved this game. The music was great,the color was great everything about this game was great. Rated 5 out of 5 by Volauvent from Deliciously clever You will be so pleasantly surprised! :D Unexpected game play has been created all over the place, especially in the HO scenes. This game is very absorbing, requiring some real focus because the devs have gone to the trouble of expanding their creative imagination beyond all the usual (and at this point - boring) ploys. This is an example of the kind of joy you will experience: "What the heck happened to the ... Oh. Oh my gosh. *There* it is! How cool is that?" Like that. I strongly recommend this game! Be on the lookout for the next Ghost Files. I just beta'd it and it's totally cool. Can't wait for it to launch. Rated 5 out of 5 by biscuitsmama from THIS ENDLESS FABLES WAS WORTH THE WAIT Endless Fables Shadow Within is the fourth game in the series and, IMHO, it is the best. Twenty years ago when your father was doing some archaeological research in Mittenwald your childhood friend Hans disappeared under mysterious circumstances. Now you receive a letter from his sister Agnes asking you to return to Mittenwald and help her search for Hans. The Endless Fables has not been one of my favorite series but Sunward Games has nailed it with this graphically beautiful game. Everything about the game is quality from the gorgeous graphics, voiceovers and well-told storyline. It didn’t take long before I was immersed in the game and had to buy it so I could continue. The game is a long with five chapters, a bonus chapter, and a fifty-six page Strategy Guide. If you choose the custom mode, when setting up the game, you will find that the times pre-set for hints and skips is better than most. The HOPS are excellent but most of them seem to be finding certain numbers of items but those items require some interaction to find and are not always easy to spot. There is variation with the style including storybook, find matching pairs, and even the list type that I prefer. 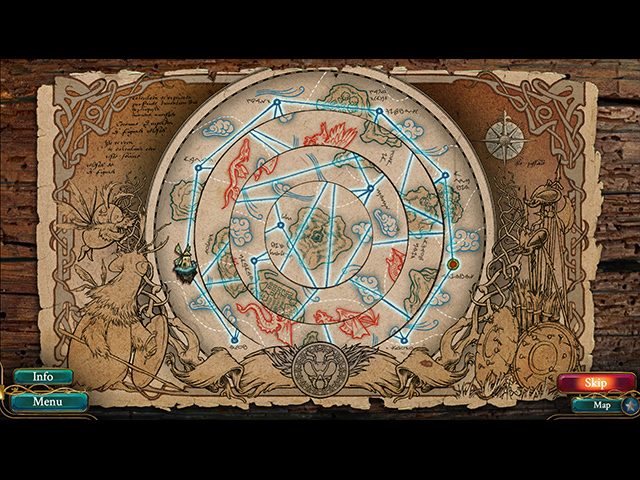 The scenes are well-crafted and not always easy to complete without using the hint button. I’m not sure of the ratio between HOPS and Mini-games but it seems that they are fairly balanced as I didn’t notice being overwhelmed with Mini-games as I played. Although we can replay the Mini-games and HOPS in the Extras section, those features don’t open until the entire game including the Bonus games have been completed so I’m not sure without going page by page through the SG exactly how Mini-games are included. Even though I don’t know the exact number, I really enjoyed the ones I encountered as I made my way through the game. Some were a bit tricky but I was able to solve them without too much difficulty. The gameplay was excellent with lots of items to find as I made my way through the storyline. It was not always immediately apparent where some found item should be used and I seemed to cart some around with me for quite some time. Although there is some back and forth in the scenes I don’t see that as a bad thing. I happen to enjoy a game that is not strictly linear where I find something and then use it within a few minutes. Overall the game is excellent and one, that to my surprise, I enjoyed a lot. I haven’t always been a fan of the Endless Fables series but Shadow Within is an excellent game. Even though I find this game to be perfect for me and the way I enjoy playing, please try the demo to see if Endless Fables Shadow Within is a game you will enjoy as well. Happy gaming! Rated 5 out of 5 by 2020moonlanding from Cheers To A Great Game This is an outstanding, polished, well written, and overall lovely game. As an unashamed casual player I love games with a lot of bells and whistles and this developer delivers. There's a lot of character interaction which I believe is the most engaging way to pull a player into a game. Once that's achieved it's easy to get immersed into the story and it's a good one about monsters and abducted children. You are there to get to the bottom of it. I love story books with the placement of items that had gone astray. The first one was rather clever as your character reads a story to an eager young child. The HO scenes are brilliant with a great deal of interaction and the puzzles are fun though I admit I've skipped a few. 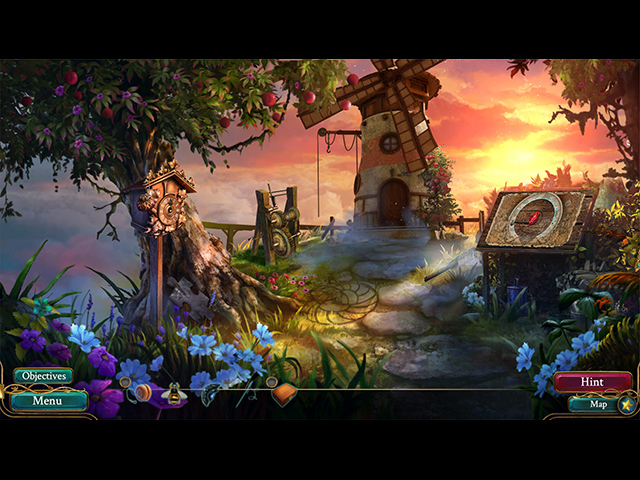 The story is set in Germany with stunning graphics and colours and wonderfully the accents are believable. There's a softness to the landscapes which adds a lot of charm. The only gripe I have is about the strategy guide. It's a bit of a mess when locating the puzzle pieces and collectible figurines... everything was seemingly out of order. There's always that one piece I have trouble finding and it's the first thing I like to do at the beginning of each scene. This game is an absolute joy to play! Cheers! Rated 4 out of 5 by Marja67 from Great game! Good game. Pretty graphics. Tried to make the tongues move in the mouths, first time I've seen that. Collections too. Lasted a long time. Rated 4 out of 5 by LikeAGoodStory from Easy Game With a Few Plot Twists There's a bit of variety in reviews of this game, which is always good, IMO. I like Sunward Games and this series, and while I do not think this is one of their best games, it is a solid 3.5 game for me. 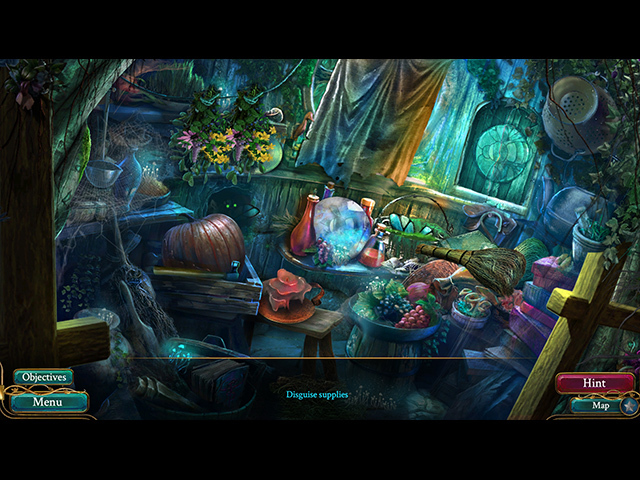 I found the hidden object scenes easy and the minigames were ones I liked (mostly) so the pace of the game was good. Both minigames and HO scenes are fairly well integrated with the plot and I found their number balanced but note that others do not. For me, storyline is most important in any game. Here, the premise is a well-known one but Sunward Games always adds a few twists and this game is no exception. I'm glad I bought it, although it is a bit of a slow start, picking up after the demo. I also played the Bonus Chapter, which is incredibly short but fun with the Fluffs. On another day, I might have found it irritating. I'm not much on collectibles (these seemed quite obvious) but I rather enjoyed the achievements. No one game is for everyone but for everyone there is a game. Enjoy. Rated 4 out of 5 by cabanaeast18 from Has everything but character development I loved everything about this game...graphics, music Throughout, the story, collectables, everything except characters. I love music throughout for continuity. There was hardly any dialogue and I just couldn't stay interested in characters at all. I'm sure many will like this game overall. I just need to care about the characters and what happens to them.